We have a rolled canvas option. It only takes 1 day to print photos to canvas so you really won't have to wait that long. 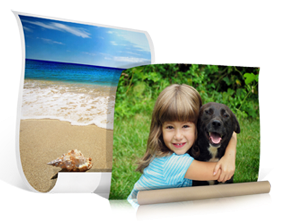 With rolled canvas printing, you can have photo canvas print/s of your family or friends hanging on your wall you could show people whenever they drop by your place. You can order a custom canvas print from us if you have a specific canvas size in mind. So why settle for cheap canvas printing when you could print your very own? Call us or check out this video for more information. I may be nuts, but I am already thinking about Christmas!!! Why not plan early, so you can enjoy the holidays and not rush, rush, rush?? UPrinting makes a beautiful rolled canvas print, at very reasonable prices!! I am very happy to offer a 16x20 rolled canvas print to one lucky winner thanks to UPrinting. i think i would use a picture of my daughter's 3 littles and give it to her for christmas! I would do a picture of the LDS temple! I would use a picture of my 4 daughters. I would definitely get my kids. I would use this for a picture I helped take at The Wave (border of AZ and UT). Paying $50 to get the high resolution image so winning this would be extremely nice so I dont have to pay more money! I would use this for decor in our new house that we should be closing on in the next week! It would great for a family picture or a picture of my girls! It's a picture of my newborn son naked in a basket with his initials on it lined with a white blanket his great grandmother crocheted for him. I would do a picture of my daughter, of course! I would use a picture of my 2 daughters. Thank you for the chance. I am not sure if I would get one with my kids on it - or if I would get one with my fur babies. Maybe a combo of both. One of my kids when they were smaller.